I liked the location and the price. They printed out the boarding pass for me for my return flight for free and they helped search for some information on public transport so that was nice. The bakery across the hotel has really nice pastries and sweets. The breakfast was good, especially for the price. Not that much choices for savory options for bread toppings, especially if you are a vegetarian though (only cornflakes, jam, nutella and cheese) but there is a supermarket around the corner so you can buy something like hummus there. They have really nice chocolate breads for breakfast! 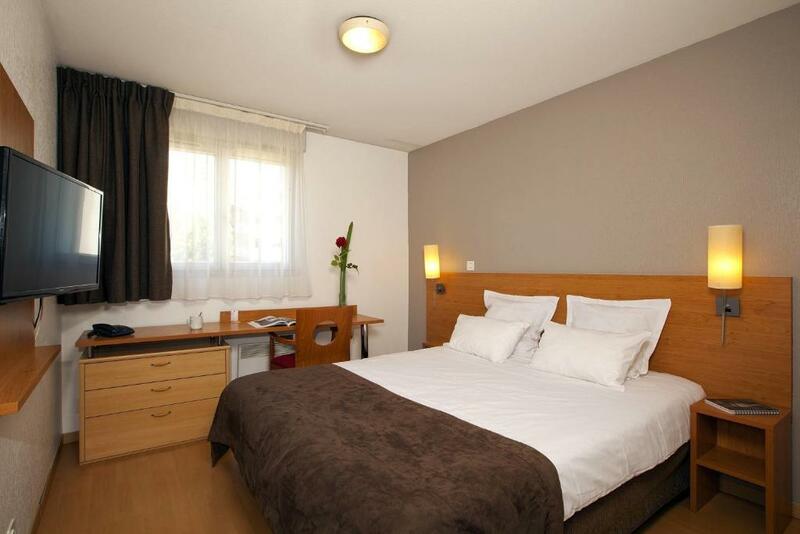 The hotel is located very central and close to a lovely bolangerie and several good restaurants ona wtaer front. The bed (mattress) was very comfortable. Easy to access from the Nantes station. Security is good for doors. Location was good. On site parking good. Reception staff were helpful. The apartment was very nice, it has all the things you need to cook and towels in the bathroom. unfortunately it was not very clean! Great location, only 5 minutes by foot to the centre. Staff kind. Good price. Convenient supermarket and bakery nearby. Not far from city centre and river. Convenient location for walking to city centre with a supermarket at bottom of complex around the corner and patisserie across the road. Pull out sofa bed was very comfortable. Appreciated the basement parking. Lovely breeze on simple rooftop terrace with good view of city skyline once eye is taken from large pipework on roof. The staff were very helpful. The room was basic but comfortable. There are nice restaurants/bars in the local neighborhood, it is right beside a bakery and a supermarket and it is within 10-15 minute walk of the city centre. It is very good value for what you pay. 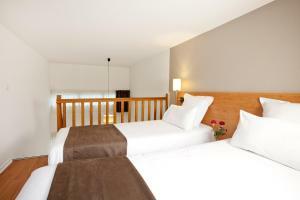 The apartment is exactly as described and is what you would expect for a self catering apartment. It is equipped with all the basic necessities. Car parking is secure. Helpful staff and clean room. Also, the location was superb in close proximity to the train station and centre of Nantes + exceptional baker only 20m away!!! 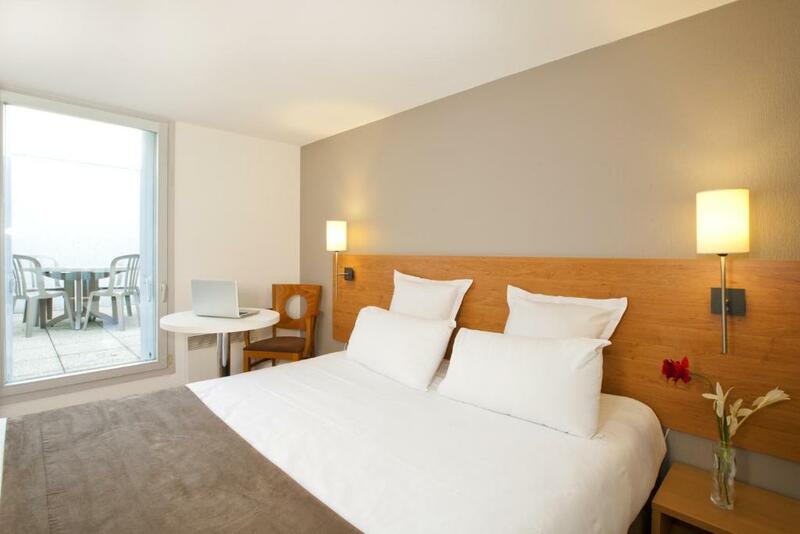 One of our top picks in Nantes.Séjours & Affaires Ducs de Bretagne is located in the heart of the new Nantes Métropole district. 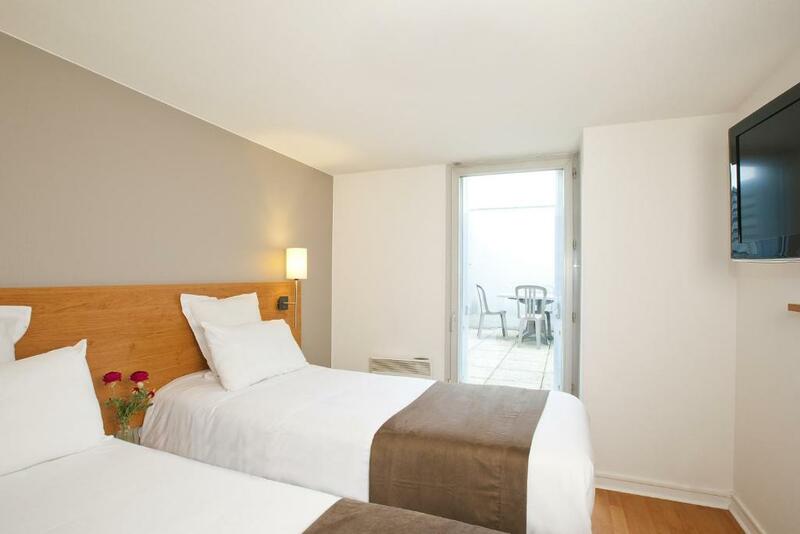 It offers studio apartments with an equipped kitchen and work area. 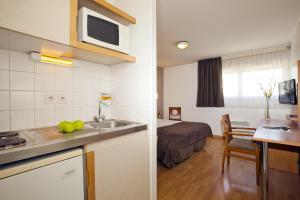 All of the apartments have free internet access, refrigerator, microwave and hot plates. 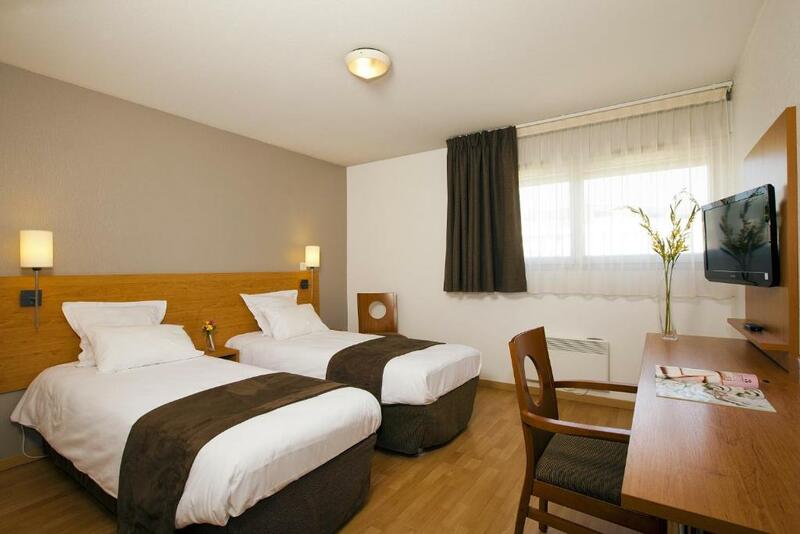 Séjours & Affaires Nantes Ducs De Bretagne is a residence that offers a range of hotel services such as weekly house cleaning. Just a few minutes from the Séjours & Affaires Nantes Ducs De Bretagne you will find the Ducal Castle, the Palais des Expositions and la Beaujoire Stadium. 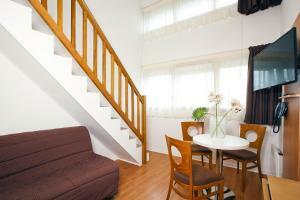 뀐 Located in the real heart of Nantes, this property has an excellent location score of 8.8! 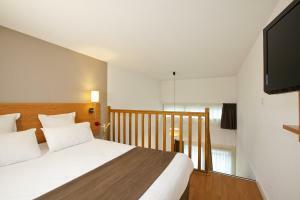 When would you like to stay at Séjours & Affaires Nantes Ducs De Bretagne? This studio features a TV, telephone and private bathroom. The kitchenette includes a refrigerator, microwave and stove. Please note that the studio cannot accommodate an extra bed. House Rules Séjours & Affaires Nantes Ducs De Bretagne takes special requests – add in the next step! Séjours &amp; Affaires Nantes Ducs De Bretagne accepts these cards and reserves the right to temporarily hold an amount prior to arrival. Séjours & Affaires Nantes Ducs De Bretagne accepts these cards and reserves the right to temporarily hold an amount prior to arrival. If you plan to arrive outside of these opening hours, please contact the hotel in advance to obtain the access code. Cleaning of the room is made once a week. When I checked in I had to pay more than the price listed on Booking.com. First of all, the tourist tax that Booking.com calculated was not correct. It said it was 0,65 euro per night and I stayed 7 nights so it should be 7*0,65=4.55 euro but Booking.com added 9 euro to the bill. I booked this hotel in December 2018 but apparently the city changed the laws in 2019 so for my stay in February 2019 I had to pay MUCH more tourist tax, which was unexpected. Secondly, I did not have hot water the first night. The next morning I went to the reception and they said there is a limited amount of hot water per room per day and when that is finished, you don't get any more hot water untill the next day. So if the previous user showers in the morning and you arrive later that day and want to shower in the night, good luck! The hotel did not offer any kind of excuses or discount for this so that was annoyying. Everything was clean but there was some mold in the bathroom. Small rooms with part of the floor in tiles, not shown in the published photos. The curtains of rooms and breakfast room had a very bad look. Bathroom with very small shower with unclean curtain, also not shown in the photos. No cleaning during five days and to change towels, we have to ask for it. The breakfast was ok, although very limited, but the worst part it was that we always have to ask for dishes, forks, spoons, knives…. generally all tableware was missing everyday, being then washed by hand at the moment by the same girl, who minutes before was vacum the floor! When we arrived at about 12:30, just to leave the luggage, the reception was closed for lunch break (12-14h) and no information was given to us. No cupboard upstairs for clothing. Across the road from conference centre. Bathroom and kitchen are to be upgraded. No light at all in corridor would have made it impossible to get out in an emergency. We had to use the torch on our phone to find the door to the room. Inside the room there was exposed wiring, loose coverings on the stairs, mouldy wallpaper and rust and mould around the shower. The apartment had not been cleaned properly and there was shaving gel on the bathroom cupboards. Someone had removed what appeared to be the smoke alarm and had left it in the gap between the 2 windows and had been using it as an ashtray. Awful. No window to open only a door onto a terrace so not great at night. Very large bathroom which was a complete waste of space with the smallest shower tray in a corner having a curtain so the floor got wet and no way to clean up the water. Housekeeping was at an additional cost! Only one of electric hobs worked. Temperature was only warm. Took 40mins to cook something in a pan. Apartment quiet and had parking on site. Bed was so comfortable. Handy having a balcony. Arrangements left for us to collect key and car park fob in secure safe due to very late arrival. Beds ready on arrival and towels left for duration of stay. Great location in city. Patisserie across the road and supermarket across corner.